There are a lot of legitimate ways to make some extra cash while being online. The Bing Rewards program is certainly one we should all consider for those extra few bucks, that combined can truly add up. If you are a registered Bing Rewards member then you can earn points for searching the web. Use Bing to do your daily searching online so you can rack up points as a Bing Rewards member. The points can later be redeemed for rewards like Applebees Gift Cards, Amazon.com shopping, donating to a charity- among many other options. If you are online researching ways to make money online or learning more about companies offering home based employment- then you are probably using a search engine quite often. Using Bing as a Rewards member can put a few extra goodies in your pocket over time. After you join, you can forget about it and continue using Bing as you normally would. Then by next Christmas you could have a nice chunk of points to exchange for gifts or splurge on yourself. The main way you can earn points with Bing Rewards is by using the Bing Search engine to do your usual web searching. You score a point for every two searches you complete. You can earn a maximum of 15 points per day. You can also earn Bing Rewards points by referring your friends. Once a friend joins and participates in the program- you can earn 200 points. Additionally, there are daily offers which you can complete to earn extra points. Completing the daily offers is simple to do and grabs you an extra point or so. For example, I clicked Today’s Offer to earn a point. Clicking the offer took me to search results of Nicollette Sheridan to honor her birthday. What Kinds of Rewards Can you Redeem? Currently your points can be exchanged for gift cards, donations and sweepstake entries. At the moment 340 points can be exchanged for a $3 Amazon.com gift card. Bing Rewards is certainly not going to relieve your financial burdens- but its a little added perk if you are online a lot. 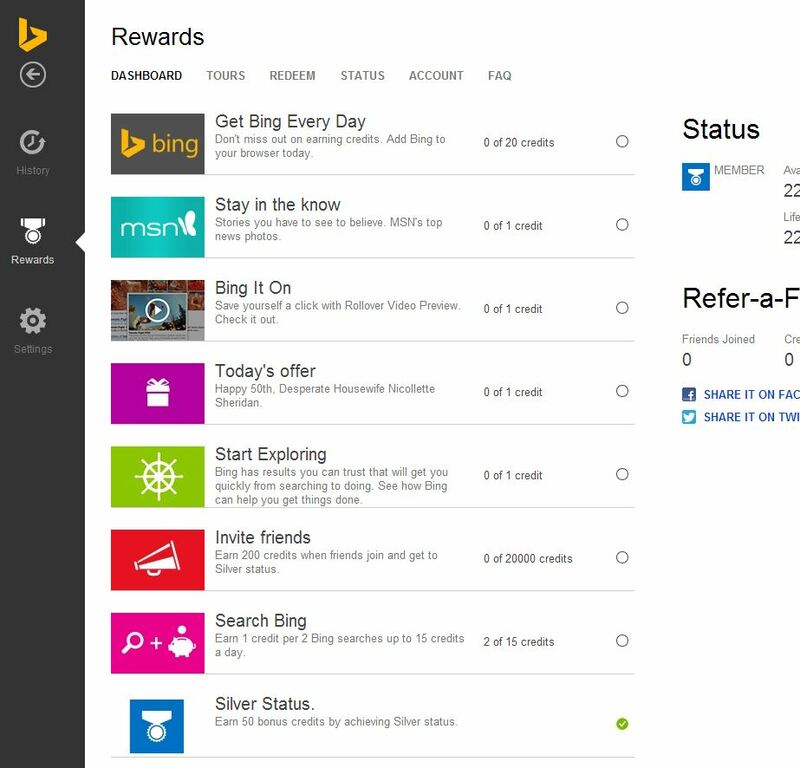 The more active you are with Bing Rewards- the higher your status level can move. Everyone begins under the “member” status and can move to Silver then eventually become a Gold status member. Gold members can redeem the same rewards for less points. For example, the $3 Amazon Gift card that requires 340 points- could be redeemed using 330 points as a Gold member. Gold Member can also earn for more searches than other members. Rather than having a maximum of 15 points a day for searches- Gold Members can earn as many as 20 points a day. Join the Bing Rewards Program and complete a few searches to get started earning points. It’s completely free to join. Awesome! Signed up for this. I’m not too crazy about redemptions like this. Cold hard cash is my first option. This helps someone, though, I’m sure of it. Just signed up for this and have 40 points today. Usually focus on Swagbucks, but I usually only get one or two paid searches a day there. This could help diversify the income stream from paid searches. Yeah I agree- its nice to do a few of these. When I need something from Amazon– I go through all my rewards sites and cash out to help pay for things. It is a nice little perk.